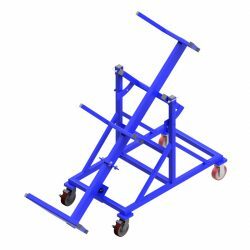 The Tilting Elevator Conduit Cart (CC-ELV-1k) provides the material-handling flexibility required to transport bulk loads of electrical conduit throughout virtually any job site. Traditional Conduit Carrier Carts are ideal for many applications, but they have a hard time fitting into some elevators and small spaces. The CC-ELV-1k adjusts to fit through narrow aisles and into elevator cars carrying a full load of conduit. The steel conduit bed tilts 45 degrees and locks into place, positioning standard 10-foot lengths of conduit upright for a greatly reduced footprint. The bed also adjusts vertically, and can be loaded or unloaded in a raised or lowered position. In order to reposition the conduit bed, users must simply depress a release paddle. A tilt-assist handle helps to keep the operation convenient and free of ergonomic hazards. Durable latches hold the bed in any of its possible positions. This unit carries all types of rigid and metal conduit, with a load capacity of 1,000 pounds. Steel construction and a scratch-resistant powder coating protect materials from damage during transport while greatly extending the Cart’s working lifespan. A pair of swivel casters improves maneuverability, while rigid casters maintain a straight travel path when necessary. Casters lock tightly to hold the unit in place during loading and unloading operations. For more details and ordering information, contact your BHS dealer or call +1 314 423 2075.